snowdeal.org > ex machina: happy belated biiiiiirthday to meeeeeeeeee! happy belated biiiiiirthday to meeeeeeeeee! yup, another birthday came and went ( on the 25th. ahem. ). i've found over the years that those like me with memorial day weekend birthdays tend to fall into two groups - those that have rather large parties to take advantage of the long weekend and unofficial start of summer and those that take take advantage of the long weekend and travel. in years past i suppose i might have fallen into the former group but these days, with an almost three old around who gets absolutely giddy at the prospect of seeing all his aunts and uncles and cousins and grandparents, i have the distinct pleasure and privilege of driving about 1,200 miles roundtrip on my birthday. no, really, i enjoy. every. single. minute. it's a fantastic opportunity to teach odin about the pleasures of driving in chicago during holiday traffic and how you can keep your patience even when maneuvering around the whackiest whackjobs that seem to be swervily attracted to your automobile. and how important it is to always obey the speed limit. and how even if you're driving for 7 hours you should only eat fruits and veggies and water. absolutely no junk food. honest. 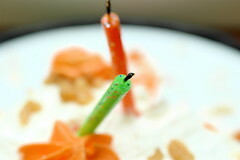 and yes, i've reached that age where people don't even bother to try to put on all the candles on the cake. A little late, but hey, happy birthday!